Garlic flavors food and is used medicinally in fresh or supplement form. For example, it may be effective for reducing high blood pressure and for slowing development of atherosclerosis, according to Medline Plus. Garlic can cause side effects, however. Always consult a doctor before trying a new supplement. One of the most common side effects of garlic is nausea, according to "The Essential Herb-Drug-Vitamin Interaction Guide" by George T. Grossberg and Barry Fox. Garlic also may irritate your mouth and your gastrointestinal tract. Other common side effects include body and breath odor, bloating, heartburn and flatulence. Garlic come in a variety of forms, including fresh, powdered, extract, tincture and oil. You are more likely to suffer nausea after consuming fresh garlic, garlic extract or garlic oil, notes James A. Duke in "Duke's Handbook of Medicinal Plants of the Bible." Duke characterizes gastrointestinal problems as somewhat rare. The nausea you experience with garlic may be part of an allergic reaction. Other signs of an allergy include diarrhea, dry throat, dripping nose, rashes, itchy eyes, hives and labored breathing, according to MayoClinic.com. An allergic reaction also can cause life-threatening anaphylactic shock. Seek medical attention if you suspect an allergic reaction. Supplemental garlic is more likely to cause nausea than garlic used as food flavoring. A typical dose for supplemental garlic in whole clove form is 2 to 4 g daily. Typical daily dosage for garlic extract is 600 to 1,200 mg, taken in divided doses. The typical dose for a fluid extract is 4 mL day, and tincture dosage usually is 20 mL a day. A usual dose for garlic oil is .03 to .12 mL taken three times a day. Common dosage for freeze-dried garlic is two 200-mg. tablets taken three times a day. Taking garlic with certain medications can cause gastrointestinal toxicity. These include the HIV drugs amprenavir, indinavir, nelfinavir, ritonavir and saquinavir. 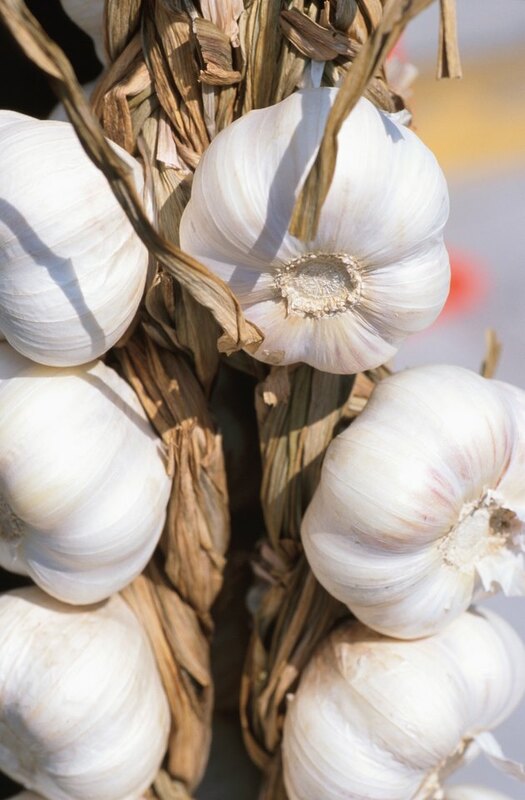 Garlic interacts with medications, including blood thinners and antiplatelet medicine. Always consult a doctor before trying a new supplement, especially if you take medication or have a health condition.